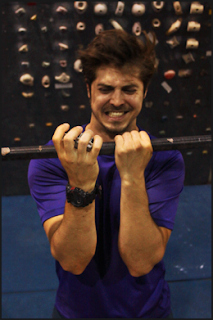 With one last desperate push you latch onto the lip and finally feel the grit under your hand, but somehow your hips keep moving away from the rock. The feeling of elation is suddenly replaced by doubt - you grasp harder on the hold. The rock won't defeat you now, you have been working this problem endlessly and you won't let this inanimate object have the satisfaction of causing your failure, yet still you feel the center of gravity slipping away from you and the tension in you arms increases - you bite down even harder. Finally, you remember your other hand might be of assistance and just as you bring it to the edge of stone, gravity wins and the skin of the overtaxed hand can no longer resist the forces being applied. The pad of your middle finger is sheared away abruptly and on your defeated descent you lament the sacrifice you have made. You have just lost some of a climber's most precious resource: skin. Understandably, everyone's specific physiology is unique and a method that may work wonders on some might be near useless for another. Still there are some healing techniques that have garnered a semblance of consistent results within the climbing community. First and foremost, is that dirty four letter word that every climber dreads to hear: rest. When there is a gaping hole in your finger and you continue to thrash it on the same move that sliced it open in the first place - it is not going to heal anytime soon. This seems obvious, but we try to convince ourselves that wrapping the offending area in a half a millimeter of athletic tape will somehow make a mystical barrier that perfectly mimics the missing skin. So when your skin starts a-flappin', here is a quick check list. In the moment, cleaning seems trivial and a nuisance and plus you don't want to wash off that chalk that would take you all of one minute to reapply - but trust me, it is important. If there is any foreign objects in the wound, the healing process with have to work around them and increase the amount of time it would take to heal. Also, if an infection occurs you may have the dubious honor of joining the half-finger club with Tommy Caldwell, albeit without the mutant climbing ability. Apply some antibiotic ointment and use a regular band-aid during the day and don't climb. Current band-aids are designed specifically to keep the newly formed skin slightly moist and resilient. At night, I have had best results letting the cut heal without a bandage - since you most likely will be moving the injured area less often while unconscious. I have also heard good things about Desitin because of its high level of zinc oxide which aids significantly in the healing process. Its drawback is the lack of antibiotic and very deep flappers are more prone to infection, so it would best to either cycle applications or use on less severe injuries. Note: Don't use super glue unless there are no other choices on hand. I had not know until recently, but apparently it has carcinogenic ingredients and the over-the-counter forms contain irritating amounts of methyl alcohol. Which you would be putting in an open wound. Is sending your last-ditch project really worth a terminal illness? Well, honestly, to some youngsters still immune to the reality of consequences I am sure this wouldn't really factor in. Now, there are certain medical glues that contain less irritating ingredients and compounds that prevent bacterial infection, yet when I have personally used these forms the seal seemed to be too weak to withstand much climbing force. The most common and natural action to take is mummifying the injured finger in athletic tape. While this probably wouldn't hurt, don't deceive yourself into thinking you can climb at the same intensity on that hurt finger. One method of gaining some protective coverage, while keeping the wrapped area less bulky is first using a singular wide piece of tape wrapped over the area only once and then using a much thinner piece of tape and wrapping in overlapping spirals. At the time of actual injury, I know it is already too late for this - yet still the best treatment is prevention. As stated in last months installment, the tear would most likely occur when the overly hardened skin of the callus pulls away from the softer skin surrounding it - so keep your sandpaper handy to make a preemptive strike on your zombified skin. On a personal note, I have previously disregarded all the above advice and ended up with a weird patch of skin on my middle finger that continuously broke open and cracked again for at least a month. And then, to make the image of my already rock mangled hands even worse with a odd patch of brownish skin instead of a clean heal. The gist of what I am getting at is that you have to give your body the time to perform its incredible feat of self-regeneration and hopefully some auxiliary assistance in the form of ointments and tape can help you along that path.